TORONTO, March 19, 2018 – The Globe and Mail leads all entrants in the 69th National Newspaper Awards competition with 18 nominations. The Toronto Star has 12 nominations and La Presse has eight in the competition, which is open to daily newspapers, news agencies and online news sites approved for entry by the NNA Board of Governors. The Edmonton Journal and Winnipeg Free Press each have three nominations, while the Canadian Press, the London Free Press, the National Post, the New Brunswick Telegraph-Journal, the Ottawa Citizen and the Vancouver Sun/Province have two each. Seven other organizations received one nomination each. There are 63 nominations in 21 categories, selected from 881 entries for work published in 2017. The winners will be announced at an awards ceremony in Toronto on Friday, May 4. Winners will receive cheques for $1,000 and a certificate of award. Other finalists receive citations of merit. The Journalist of the Year will be chosen from among this year’s winners, and revealed at the gala after all category awards have been announced. The Journalist of the Year receives $2,500. This is the 69th year for the awards program, and the 29th under the current administrative structure. The Awards were established by the Toronto Press Club in 1949 to encourage excellence and reward achievement in daily newspaper work in Canada. The awards program is owned and operated by the Canadian Daily Newspaper Awards Programme Administration Corporation under the direction of its board of directors (referred to as the “Board of Governors”). Robert Cribb and Marco Chown Oved of the Toronto Star are nominated three times, in Arts and Entertainment, Business and Politics. Alex Boutilier joins them as a third contributor on one of their entries, in the Politics category. Stephanie Nolen of the Globe and Mail is nominated in two categories: Arts and Entertainment and International. That gives her 15 nominations all-time, one short of the record held by Brian Gable. Nolen has won seven NNAs. Isabelle Hachey is nominated twice: in the International category and alongside three La Presse colleagues in the Investigations category. That gives Hachey seven nominations all-time, and five in the past two years. 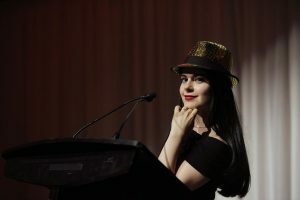 Sara Mojtehedzadeh of the Toronto Star is nominated in two categories: Investigations (with colleague Brendan Kennedy) and Business (as part of a five-person team). Mojtehedzadeh was also a finalist in Beat Reporting in 2016. Ian Willms has been nominated twice, in the category of News Photo and the new category of Photo Portfolio/Essay. Willms is a freelance photographer whose nominated work was published by the Globe and Mail. Serge Chapleau of La Presse is nominated for the 14th time in Editorial Cartooning. Chapleau has won the award seven times previously. Bruce MacKinnon of the Halifax Chronicle Herald received his 11th nomination in the Editorial Cartooning category. He has won six times previously, and was the inaugural winner of the Journalist of the Year award in 2015. Grant Robertson of the Globe and Mail received his 11th nomination. He has five previous wins as an individual and one as a member of a team. Paula Simons of the Edmonton Journal earned her eighth nomination. She won (along with four colleagues) in the Investigations category in 2013. Steve Buist of the Hamilton Spectator has been nominated for the eighth time, this time in the Sports category. He is a two-time winner as a member of a team. Sean Fine of the Globe and Mail earned his seventh nomination. He won in 2014 in the Politics category. Jennifer Wells of the Toronto Star is a finalist for a seventh time, in the Business category along with four colleagues. Another member of that group, Jim Rankin, is nominated for a sixth time. Marty Klinkenberg received his sixth nomination, his second as a Globe and Mail journalist. He has won four times previously, three times for the New Brunswick Telegraph-Journal. The Athletic, a digital subscription-based service, received its first nomination, for Sunaya Sapurji in the Sports category. Eric Andrew-Gee, Globe and Mail, for an attempt to reconstruct the disputed and tangled Indigenous heritage of renowned Canadian author Joseph Boyden. Robert Cribb and Marco Chown Oved, Toronto Star, for exposing the profits earned by ticket resellers manipulating sales for concerts by some of the world’s most popular performers. Stephanie Nolen, Globe and Mail, for reporting on how Canadian writer Alberto Manguel was faring as director of Argentina’s national library. Sean Fine, justice reporter for the Globe and Mail, for an examination of Canada’s judicial system after time limits on criminal proceedings were imposed by the Supreme Court. Marina Strauss, who covers retailing for the Globe and Mail, for a package of stories that included coverage of the demise of Sears Canada and internal strife at Tim Hortons. Caroline Touzin, La Presse, for stories on the health beat, including a report on the dangers posed by sugary, high-alcohol drinks that are popular with young people in Quebec. Bryan Passifiume, Calgary Herald/Calgary Sun, for coverage of a raging wildfire in Waterton Lakes National Park. A team from the Globe and Mail, for coverage of the killing of six Muslim worshippers at a mosque in the Quebec City suburb of Ste-Foy. A team from La Presse, for reporting on an attack by a white supremacist on the Centre culturel islamique de Québec in Ste-Foy that left six worshippers dead. Robert Cribb and Marco Chown Oved, Toronto Star, for reports revealing that Canada is a tax haven for foreigners looking to hide their money. Nicholas Keung, Sara Mojtehedzadeh, Jennifer Wells, Jim Rankin and Kelsey Wilson, Toronto Star, for a series on the use of temporary migrant workers in Canada’s food industry. Grant Robertson and Tom Cardoso, Globe and Mail, for uncovering the fact that at least $1 billion in fines for securities violations have gone unpaid and unenforced by regulators across the country. Kate Allen, Toronto Star, for a story that looked at the effects of climate change not on humans, but on other residents of this planet, from bumblebees to shrubs. Larry Pynn, Vancouver Sun, for exploring the grizzly bear trophy hunt from multiple perspectives including locals, researchers, First Nations, politicians, environmentalists and tourism operators. Jennifer Yang, Toronto Star, for delving into whether an imam who came under attack for anti-Semitic remarks had actually said what he had been accused of saying. Mike Deal, Winnipeg Free Press, for a photo of a Canada Summer Games volunteer wearing a ballcap adorned with collectible pins. Ashley Fraser, Ottawa Citizen/Ottawa Sun, for an image of a surfer on a foggy day. Olivier Jean, La Presse, for a photograph of a beehive being fumigated. Isabelle Hachey, La Presse, for a series of stories about the war in Syria. Stephanie Nolen, Globe and Mail, for stories about suicide, political crisis and desperation in South America. Nathan VanderKlippe, Globe and Mail, for stories about torture and corruption in Asia. Robyn Doolittle, Globe and Mail, for “Unfounded,” which revealed how frequently police forces across the country concluded that sexual assault allegations, even in cases with seemingly strong evidence, did not warrant the laying of charges, or even further investigation. Isabelle Hachey, Yvon Laprade, Gabrielle Duchaine and Agnès Gruda, La Presse, for “Le Montréal sans-papiers,” an in-depth look at the precarious and clandestine lives of refugees and their families who try to survive in Montreal, a so-called sanctuary city, without legal status. Sara Mojtehedzadeh and Brendan Kennedy, Toronto Star, for “Undercover in Temp Nation,” an investigation into how immigrant workers and other temporary employees risked life and limb in a Toronto bakery. Grant LaFleche, St. Catharines Standard, for a series of stories on the impact of child abuse by a Roman Catholic priest. Randy Richmond, London Free Press, for exposing scandalous conditions and mismanagement at a local detention centre. Amy Smart, Victoria Times Colonist, for a series that delved into barriers that still exist for individuals wanting to take advantage of medical assistance in dying. Katie Daubs, Toronto Star, for the profile of a man who chronicled Canada’s roadside attractions on the Internet. Richard Warnica, National Post, for an in-depth profile of Rebel Media founder Ezra Levant that explains why its subject can’t seem to stop himself from going too far. Jesse Winter, Toronto Star, for tracing the heartbreaking story of a man, raped as a child by his uncle, who was failed by family, friends, governments and the justice system. Darryl Dyck, Canadian Press, for an image of a mother clutching her eight-year-old daughter at the charred remains of their remote First Nations home after a forest fire. Ian Willms, Globe and Mail, for a photograph of an asylum seeker from Nigeria fleeing to Canada on a cold, dark night. Larry Wong, Edmonton Journal/Edmonton Sun, for a picture of congregants mourning three members of their church who had been killed when a thief fleeing police crashed into a passing minivan. Todd Korol, Globe and Mail, for an essay looking at the life of rodeo cowboys following the suicide of a bull rider. Martin Tremblay, La Presse, for an essay documenting the story of refugees crossing the border shortly after the election of Donald Trump left them feeling threatened down south. Ian Willms, Globe and Mail, for an essay on 22 asylum seekers who crossed into Canada near the town of Emerson, Man. David Akin and Chris Selley, National Post, for coverage of Prime Minister Justin Trudeau’s secret visit to a private island owned by the Aga Khan. Robert Cribb, Marco Chown Oved and Alex Boutilier, Toronto Star, for a series that revealed where politics and the offshore tax-haven industry intersect in Canada. Noor Javed and Kristin Rushowy, Toronto Star, for reports on dysfunction at the York Region Public School Board. Jeremy Agius and Matthew French, Globe and Mail. Patrick Bertrand, Henri Michaud, Benoit Dussault and Caroline G. Murphy, Le Journal de Montreal. Dan Fumano and Matt Robinson, Vancouver Sun, for an investigation into the case of Phillip Tallio, who still maintained his innocence after 34 years of incarceration for the murder of a child. Jane Sims, Morris Lamont, Brice Hall and Mike Faille, London Free Press, for “27 Minutes,” which documented how a woman improbably ended up alive and well after being submerged in ice-cold water for almost half an hour after a car accident. Doug Speirs and Ruth Bonneville, Winnipeg Free Press, for “Class of 2017,” a 13-year journey to document the major and minor milestones of childhood and adolescence for a group of children born in the year 2000. Marcus Gee, Globe and Mail, for explaining what the death of a small-city newspaper would really mean for that community. Ingrid Peritz, Globe and Mail, for recounting the devastating experience of a man who survived the Quebec mosque shootings. Philippe Teisceira-Lessard, La Presse, for illuminating the lives of a farm couple as they sadly abandoned their life’s work. Steve Buist, Hamilton Spectator, for “Collision Course,” a series of stories that explored the impact of concussions on retired Canadian football players. Marty Klinkenberg, Globe and Mail, for reporting on the aftermath of the suicide of a young Canadian bull rider. Sunaya Sapurji, the Athletic, for “Grassroots to Gold,” a series comparing how countries other than Canada develop their hockey players. Nathan Denette, Canadian Press, for a shadowy image of a tennis star making a shot. Michael Robinson, New Brunswick Telegraph-Journal, for a shot of a basketball player desperately lunging to keep the ball in bounds. Andrew Francis Wallace, Toronto Star, for a photograph of a rugby player with a badly mangled finger. Nominated entries can be viewed at the NNA website at www.nna-ccj.ca. The link to the nominated entries can be found on the right side of the home page, just below the photo of the 2016 Journalist of the Year.